At Bonneville Dam along the scenic Columbia River that divides Oregon and Washington states, a battle is raging between two species of mammals at very different levels of the food chain. At the top, of course, are humans, who say they are trying to prevent depleted populations of endangered Chinook salmon and Steelhead trout from coming any closer to extinction. Lower down, are hungry California sea lions, who've discovered that the dam -- located about 37 miles east of Portland -- is an excellent place to feast on the fish during their annual run. Not so surprisingly, the sea lions are losing. Year-to-date, six of the portly pinnipeds have been euthanized by state wildlife officials under a special federal program that basically allows them to be killed if they are caught eating endangered fish. 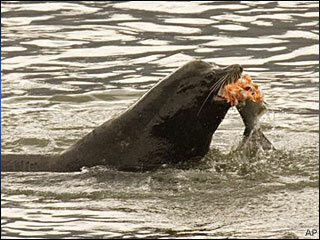 But as the sea lion death toll mounts, so too does the anger over their deaths. Leading the protests has been the Humane Society of the United States. The animal welfare organization takes issue with the fact that area fisherman are allowed to catch and keep up to 16% of run -- expected to be a record 470,000 fish -- while sea lions are estimated to be munching on 4% of the run, says Sharon Young, marine issues field director for the organization. "This is about the integrity of the [fisheries] management program," says Young. "You can't sensibly say that a 4% take by sea lions is unsustainable and yet at the same time allocate up to 16% for fisherman. It makes no difference to the fish who eats them." Officials counter that the fisherman mostly hook salmon raised in hatcheries while sea lions don't differentiate between wild and farm-raised fish. Rick Swart, a spokesman for the Oregon Department of Fish and Wildlife's northwest region, concedes it is "very contentious and difficult" to decide what to do about the sea lions. "There are a lot of strong emotions on all sides of this issue," he says. Monitoring by wildlife officials suggests that sea lions are eating about 3% to 4% of the upriver run at the dam alone, Swart says. But, he adds, there are more than 140 miles of river from the Pacific Ocean to the dam. Any fish eaten downriver aren't captured in those numbers, he says. "I am sure that anglers would say that the sea lions are getting way more than their share," he says. Decisions on how to allocate the fish are made with input from various groups, including sport fisherman, commercial fisherman and Native American tribes. Bottom line, Swart says: "There are a lot of competing interests that want these fish." Swart says the killing of sea lions is considered a last resort. The preferred method of keeping predators from chowing down on fish is called "hazing," which entails firing rubber bullets at the animals or creating underwater explosions to scare them off. But hazing only works when wildlife officials are there to do the job, which is Monday through Friday. "On the weekends, the sea lions move back in," he says. "Some people think they're foraging at night." Before a sea lion is killed, several criteria must be met, according to the program, which is administered by the Oregon wildlife officials, their counterparts in Washington state and the National Oceanic and Atmospheric Administration. Among the requirements, the sea lion must be individually identified, must be observed in the Bonneville Dam area on at least five days, must be seen taking one salmon and must have been present during one hazing operation. In other words, officials are looking for "chronic offenders." Swart says the sea lions are "humanely euthanized" by a veterinarian. Effective Fish Management or 'Treadmill of Death'? Under the program last year, officials killed 11 sea lions, according to a report from the Oregon Department of Fish and Wildlife. Four others were taken to zoos or aquariums. It's unclear how many could be killed this year, but the Associated Press says more than 60 sea lions are being tracked as repeat offenders. Program proponents argue it has worked, saying the number of sea lions, which can weigh up to 600 pounds, has dropped at the dam, according to the AP. However, the 4,489 salmon that they gobbled up last year was the most since the monitoring began in 2002. The Humane Society's Young maintains that officials are pursuing a futile strategy, as there will always be new sea lions that will come. "The strategy would be more effective if they didn't keep getting replaced," she says. "It is just a treadmill of death, if you will." If officials were truly concerned about replenishing endangered fish stocks, Young says, they'd worry more about limiting logging and agriculture that result in river conditions that are harmful to fish. Officials could also find a better way to encourage successful runs than requiring fish to jump through narrow slits in the hydroelectric dam, she adds. The situation at Bonneville Dam could get even more complicated soon, says Young. Stellar sea lions are showing up in greater numbers to feed on the fish, she says. Because Stellars are protected by the Endangered Species Act, they cannot be killed. For his part, Swart says the sea lion management program, now in its third year, is scheduled for a review. "After this year's efforts, this program will be reevaluated and someone a lot higher up in the chain of command will determine whether it is worth going forward with the program in the future or not." No word yet on whether California sea lions have hired a "K" Street lobbyist.